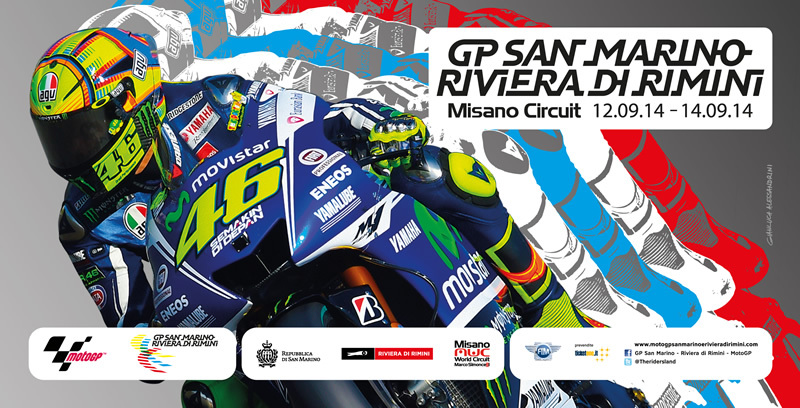 From 12 to 14 September 2014 the Misano World Circuit Marco Simoncelli will host the TIM Grand Prix of San Marino and Riviera di Rimini. The best drivers worldwide of classes MotoGP, Moto2 and Moto3 will meet at the Misano World Circuit “Marco Simoncelli“ in Misano Adriatico. MotoGP has its ideal location in what is known as the Riders Land, a land of extremely generous and extraordinary champions and it still protagonist with young entrants with great ambition for the motorsport. The fans of the world of motorsports will experience the atmosphere that reigns in the places where the bikes are not only designed but implemented in order to win. And they do it thanks to the pilots of this land as Valentino Rossi, Andrea Dovizioso, Mattia Pasini, Alex De Angelis and Niccolo Antonelli. The sporting spectacle of Grand Prix motorcycle racing gets under way and the champions, famous worldwide, put the finishing touches on their race strategies and celebrates this year its ninth edition. The mother of all competitions, the MotoGP race is for motorbikes with the largest cc engines, and it is very exciting, with the best motorcycle racing champions. Of course the race is the pinnacle event, but in the week leading up to it, there will be many other events which attract fans who want to enjoy the last bit of summer by the sea.